They are married to NRIs but wedded to separation. They ‘know’ their husbands only through a series of letters and phone calls made diligently every week or fortnight. The husbands are abroad making the extra dollars that would make life more comfortable for those back home. But despite the lure of the lucre, the pangs of separation become unbearable and the wives trudge through a lonely existence. Minna Zutshi finds out that though life goes on for these women, it is without a sense of fulfilment. Harjit Kaur, Manjeet Kaur and Harbans Kaur have spent their lives waiting without any expectation of a reunion with their husbands. Deeply perturbed over the overshadowing of written word and literature by West-oriented television programmes, Giani Gurdit Singh, the world renowned Punjabi author of "Mera Pind" fame, feels that the growing lack of interest among younger generation in serious literature was a huge loss with far-reaching consequences for the nation. 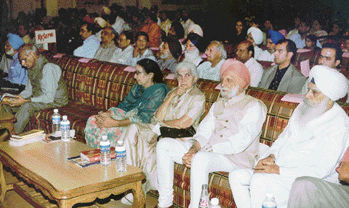 Eminent journalist Kuldeep Nayyar (far left) at a function organised by Doordarshan Kendra, Jalandhar, on Saturday, May 28. He was awarded the Doordarshan Panj Pani Sanman-2005 for his contribution to journalism. Other eminent awardees are from left: Dalip Kaur Tiwana (literature); Mrs K S Duggal; Kartar Singh Duggal (broadcasting) and Giani Gurdit Singh (heritage and culture). Second row centre: Budh Singh (NRI) and Nek Chand (Fine Arts). The death of two-year-old Shobha and 30-year-old Bhagia Devi in a factory building collapse at Bast Bawa Kehl area here on May 26 has virtually exposed the failure of the Municipal Corporation Jalandhar (MCJ) authorities to check the mushrooming of industrial units and commercial buildings in an unauthorised manner within the city limits. Nothing probably can give one more joy than getting drenched in a hot summer afternoon. A 57-mt high "Wonderfall" coming up at Bayside Water Park in Wonderland Amusement Park on the Nakodar Road next month is being designed to give visitors a cool, thrilling experience. The unprecedented hike in sewerage charges ranging from 300 to 600 per cent for different category of consumers by the Municipal Corporation Jalandhar (MCJ) has caused a great resentment among city residents, even as the Opposition parties have dubbed the move as "anti-people". Stevia, the wonder plant, is here to boost economy of Doaba farmers as a new and more promising vehicle of diversification and simultaneously as a panacea for a large number of people, who are suffering from a number of common ills, including diabetes and hypertension. Roadsides of Kapurthala have been encroached upon by vendors. This is proving to be a traffic hazard and creating parking problems. Rehriwalas and auto-rickshaws occupy both sides of the road, making the passage narrow for buses and other vehicles. Traffic jams are frequent here. The temple offers a peep into the last century. 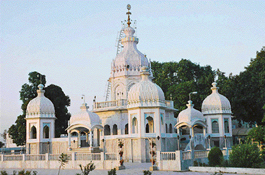 Shri Vishvakarma Temple on the Banga Road in Phagwara is famous for its beauty and fair held on Vishvakarma Jayanti. It is equally famous for yet another thing - its age. It is nearly a century-old temple. This temple was constructed in 1911 under the supervision of Pandit Nathu Ram of Mandali village. Punjab Technical University (PTU), in a major initiative to boost rural education system, has decided to introduce mobile teacher programme for imparting vocational training to students of government schools in rural areas of the state under the Distance Education mode. Value-oriented education with all-round development of personality of students is the aim of the Guru Nanak College of Education for Women, Kapurthala, says acting Principal, Ms Gurcharan Kaur. 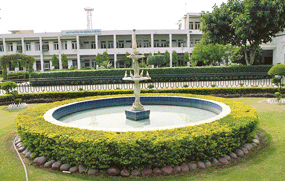 It was in 1966 that the college was started in Elysee Palace (on the Mall Road) built by Bikrama Singh in 1862. At the age of 75, this sportsman still works seventeen hours a day for promoting women's hockey in the state. The students of primary section of Lawrence International School were taught salad-making by their teachers on Friday. The kids were told to bring five pieces of any raw edible vegetables. The Northern Railway Union has criticised the Railway Ministry for not filling vacant posts under the Ferozepore division for the past several years. The union has demanded the immediate implementation of their demands. It’s a long wait for them. Sometimes, the wait extends even to decades. Some of these women live in boisterous joint families, while others plod through life alone. Some are well-read and rolling in degrees. Others can barely scribble their name. Some are from upper middle class, with all trappings of in-things. Others somehow manage to eke out their living. And most of them hardly know one another. But their life has a common motif — loneliness. These women, married to ‘NRIs’, ‘know’ their husbands only through a series of phone calls or letters. Not that their husbands are uncaring brutes. It’s only that those men have reasons enough not to leave the foreign country where they are staying. Jalandhar Plus spoke to a few of these women from the city and villages. Harbans Kaur is in her 40s. She lives at Kang Sabu, a village in Nakodar tehsil, Jalandhar. The first time you meet her, there’s a certain gleam of sadness in her eyes. But she maintains tough as nails demeanour. She wants to parry the questions about her husband’s absence, though she’s too ready to part with information related to days and dates in her marriage. Ad hocism has become a permanent feature in Harjit Kaur’s life. She got married when still in her teens to a man who was not exactly well-off. They stayed at Kapur Pind, near Jalandhar Cantt. Monetary considerations made him leave for foreign shores. There may be yet more loneliness in Harjit’s life. Already her husband’s employer is offering to sponsor her son to Italy. In coming years, her son, too, may leave her. Manjeet Kaur, in her early 40s, is not easy to draw into conversation. She giggles a bit and then lapses into silence. Only when the talk veers around her children, does she open up. Satinder (name changed) stays in a village near Jalandhar. Only a promise that her identity would not be revealed makes her speak frankly about her life. She’s young and bubbling with energy. She wants to live each moment. Her girlishness is too perceptible. She’s not willing to let anything scotch her dreams. She’s hopeful that she would join her husband soon. Hers is a joint family. Her ebullience is not much liked; it is tolerated grudgingly. But even a slightest hint of deviation from the strict family norms is frowned upon. She cannot go out alone. She must be chaperoned by an older woman. If she has to buy things for herself, she must keep her excitement in control. She has to talk in measured tones. Rekha is a young, educated woman. A science teacher at a local school, she got married to a young engineer working in Italy through an advertisement in a newspaper. Giani Gurdit Singh had shot into fame with the huge success of his novel, "Mera Pind," which was published for the first time in 1961, and which was still in print after its seventh edition hitting the market in 2003. The novel, depicting village life of Punjab in its very true sense, had not only fetched a UNESCO award, but also earned a wide acclaim. Khushwant Singh said of the novel, "Mera Pind is a collection of delightful essays on various aspects of village life in the Eastern Punjab. The book gives us a lively picture of pastoral life, written in delectable prose, studded with aphorisms, proverbs and songs. The one thing which will give Mera Pind a long lease of life, if not immortality, is the fact that the author has used the Punjabi language as it is spoken by the common people. The Punjabi of Mera Pind is full-blooded and masculine." On the same lines, the online edition of the Encyclopaedia Britannica found the book to be "one of the most outstanding novels depicting rural life in Punjab…. almost a classic in Punjabi literature." Giani Gurdit Singh, who was at the Browser Bookstore here for a literary interaction, shared his thoughts with Jalandhar Plus. " I don't agree that the importance of the written word has vanished. But at the same time, I don't relish the hard fact that a big section of the younger generation has somehow lost interest in literature. Most of the youngsters are interested in watching those television programmes, which either present the fragmented Punjabi culture or distort it to a certain extent. Can they tell the message weaved in "Shakuntala", which is an immortal classic?" questioned Giani Gurdit Singh. Asked to explain the role of media in the propagation of Punjabi culture, he quipped, "I don't understand." "But I would say that if we continue to be indifferent towards literature, particularly the genre which explains our culture, we are going to suffer a lot. It would be an irreversible loss and it would continue to haunt us for generations together," he said. He expressed his concern at the way in which different "Birs" of Sri Guru Granth Sahib were not being preserved on account of their being "old". On his part, he has decided to do an elaborate research on the history of "Birs" of Guru Granth Sahib. " I am also likely to go to the UK for this purpose soon," he added. The factory building was under construction for the past few weeks. Its owner Kartik Chabra had allegedly not got the building plan of the factory approved by the civic body. The incident occurred when suddenly one of the walls of the building collapsed and its debris fell on the "jhuggis" adjoining the factory. The inhabitants of the "jhuggis" identified as Bhagia Devi and Shobha died on the spot, while four-year-old Santosh, and Aggam were badly injured. The victims originally hailed from Bihar and were engaged in scrap vending. Though senior police and civil officials rushed to the spot to assess the situation, no one from the district administration or the police or the civic body or the upcoming industrial unit came forward to lend a helping hand in shape of medical or financial aid to the kin of the victims. The bereaved families were only given Rs 1000 each to cremate the bodies of the victims. Interestingly, the officials of the town-planning wing of the MCJ, who are responsible for checking illegal construction of buildings in the city, seemingly deemed it fit not to even visit the spot of the mishap, what to talk about initiating legal proceedings against the factory owner for raising the structure allegedly without getting its building plan approved by the civic body. "I don't know anything about the construction of such an illegal building and its subsequent collapse. The department will take strict action against the defaulter for not obtaining prior approval to raise the building as mandatory under the Punjab Municipal Corporation Act," said Mr V.K.Talwar, Senior Town Planner, when asked to comment on the functioning of the town-planning wing. The district police, too, hastily completed the formalities and registered a case against Kartik Chabra and the building contractor Hira Lal under Section 304 A of the Indian Penal Code (Death due to negligence). The police, however, failed to arrest the accused even after eight days of the incident. "Both of them are evading arrest even as we are trying to nab them," claimed Mr Balkar Singh, SHO, Sadar Police station. Meanwhile, the deceased girl's mother Manju is still trying to come to terms with her daughter's death. "God has done injustice to me. My daughter died like an animal, as no one came forward to take action against the factory owner, who is using his clout in the political and bureaucratic circles to save his skin. I was given only Rs 1000 to cremate the body of my daughter," says Manju, tears rolling down her cheeks. Aggam Lal, another victim who lost his wife Bhagia Devi in the mishap and himself got injured in the same mishap, is under treatment at the Civil Hospital. He has not received any medical or financial aid from any government or private agency. "Since we are migrant labourers and belong to poor families, no one is here to help us. It is basically cruelty against humanity, as discrimination on the basis of caste and creed is very much evident in our case. Though loss of life cannot be compensated, the state government must take steps to compensate the aggrieved families," he maintains. The waterfall will 'come down' from the huge artificial rocks being constructed out of cement. The pool beneath the waterfall is being connected with the "activity pool" meant for kids. It is currently being expanded in size to accommodate families. A small elevated path is also being constructed along the base of the waterfall. The eight-year-old Wonderland is equipped with several other unique water activities. One of the most happening corners is the aqua dance floor, where boys and girls enjoy dancing on the tunes of the latest Punjabi hit numbers underneath a canopy that has artificial clouds from where the water comes down like a rainfall. The floor underneath the canopy has been carved out of pieces of wooden planks, eliminating any chance of slipping down. The wave pool is another attraction of the water park. The tidal waves initiated by electric power give visitors a feel of being by the seaside. The giant and speed slides on an inflated seat is yet another enjoyable activity for boys and girls who dare to come down from a height into a water pool. With many a thrilling ride, the water park gets over 500 visitors a day and over a thousand on weekends. Mr Surjit, manager of the Wonderland, said that many schools and colleges brought their students for a trip during summers to the park. He said that the student trips came in concessional packages and all students preferred a water park over the dry one which has other thrilling rides, including bumper cars, flying jets, horror house, boating, kiddies' boating, play house, flying dragon and a slide splash. The manager also pointed out that safety and hygiene were the topmost priorities with the management. He said a squad of 30 life guards was always on the vigil in the water park to ensure that no untoward incident occurred and that no one misbehaved with the girls there. He said no footwear was allowed inside the park and it was mandatory for everyone to wear "disinfected dresses" given by the authorities. The MCJ authorities were earlier charging Rs 20 per month as sewerage charges from the consumers, irrespective of the area of their house. Now, the civic body has decided to charge Rs 60 per month from the consumers having a house measuring five marlas (300 per cent hike), Rs 90 from the consumers having house measuring over five marlas and up to 10 marlas (450 per cent hike) and Rs 120 from the consumers having house measuring more than 10 marlas (600 per cent hike). "It is an anti-people decision to implement the unprecedented hike in sewerage charges. My quarterly bill for the water and sewerage facilities has risen manifolds. This has affected my budget badly," rues Ms Lalita Mohan, New Kartar Nagar locality. Interestingly, the MCJ authorities have also decided to collect arrears for the past 10 months from the consumers. While the city residents and the councillors of the Opposition parties have criticised the ruling Congress Party for pursuing "anti-people" policies, the authorities have termed it as a routine hike. "The true face of the Congress Party has been exposed now. Instead of providing better facilities to the city residents, the MCJ authorities have imposed hefty sewerage charges. This is highly deplorable. We will oppose the decision tooth and nail, even as we are examining the legal option to challenge the decision in the court," said Mr Kishan Dev Bhandari, leader of the Opposition in the MCJ House, adding that the BJP had decided to hold mohalla-wise meetings to expose the alleged misdeeds of the ruling party. The MCJ authorities, however, maintained that the State Local Bodies Department had issued an order in this regard about two years back. "While the state government had stayed its implementation for one year, now the stay has been vacated. We are bound to follow the government's instructions," said a senior MCJ official, while maintaining that the Municipal Corporations at Ludhiana and Amritsar had been charging the increased tariff for sewerage facility since the past two years. The Opposition leader further demanded that the civic body should withdraw the hike immediately. The Opposition councillors alleged that the issue was never discussed at the meetings of the MCJ House. Such a discussion was mandatory under the Punjab Municipal Corporation Act, they added. The act states that all instructions and guidelines of the State Local Bodies Department should be placed at the table of the MC House to be discussed by the members of the House. Lieut Col Rattan Singh (Retd), a resident of New Jawahar Nagar, says, "We have already been facing acute water shortage since the onset of summer season. The move to increase tariff for sewerage facility has further aggravated the problem. The MCJ should immediately withdraw the hike and instead make arrangements for smooth supply of potable water, which seems to be a luxury nowadays." MCJ Mayor, Mr Surinder Mahey, was not available for comments, as his staff maintained that he was out of the country. Stevia, or Stevia rebaudiana, a native plant of Paraguay, is a sweet herb, which not only is a major source of high-potency zero calorie bio-sweetener, but is also said to be highly beneficial in treatment of common maladies such as diabetes, hypertension, indigestion, obesity and is also said to be a hope for those who want to curb their ever-increasing addiction to tobacco and alcohol. The leaves of stevia plant contain 15 to 20 per cent of stevioside, a sweetening agent, which is 300 times sweeter than cane sugar. The powder made from the extraction of juice of stevia leaves is a very economical and zero-calorie substitute of sugar, which, according to the National Medicinal Plant Board of India, is also known for its therapeutic properties in effective treatment of cough, joint pains, liver ailments and skin rejuvenation. Seeing a bright future for themselves on account of the spiralling demand for this "natural sweetener", which is recognised as an effective alternative to sugar and chemical-based sweeteners, a couple of enterprising farmers of Doaba have started trying their hands at the cultivation of stevia. The cultivation of stevia is also being encouraged by the National Medicinal Plant Board, which offer farmers a subsidy of up to 30 per cent of their total project cost. "We are satisfied from the results of stevia, particularly from the diversification point of view. An acre of stevia field can give farmers a minimum annual profit of Rs 1.5 lakh, which no other crop can give at the moment. Moreover, the government subsidy further lowers the plantation costs and there is no marketing problem," says Mr Baldev Singh Bhalana, a former agricultural technocrat and one of the pioneers in the field of stevia plantation in Punjab. He is so enthralled by the success of his "sweet venture" that he has not only started purchasing matured stevia plants from other farmers, but has also planned to set up a mechanised plant for making "white calorie-free sugar" from stevia leaves. "A large number of farmers are coming to me for learning the technique to grow stevia plant, which grows well in rich, well-drained soils like red and sandy loam soils found almost in all parts of Punjab." Mr Bhalana has already set up stevia plantation on three acres of land at Dhoankha Jagir village and Bhalana village of Kapurthala district. Mr Tarlochan Singh, a farmer of Brindpur village of Kapurthala district, is also thrilled to see the crop of "his future" growing at a fast pace. "It's a comparatively disease-free plant, which does not need excess watering. So it suits us the most. My plants are growing well and are two months old now," he said. 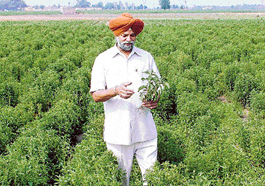 He is growing stevia plants on his three acres of land at Bhalana village near the Rail Coach Factory of Kapurthala. Mr Deepak Mittal of Sonalika Tractors fame has also initiated stevia cultivation on his farm near Manguwal village in Hoshairpur district. "We have planted 2.5 acres of stevia and we expect a rich dividend from it. In our estimation, each acre would give us a profit of Rs 2 lakh, which is a good deal, particularly when no other crop gives such a high profit these days," said Mr Gautam, manager of the farm. According to Mr Bhalana, stevia is a perennial crop, which grows for at least five years, during which farmers have to do plucking of stevia leaves. According to Ray Sahelian, co-author of Donna Gates book, "The Stevia Cookbook", "Stevia is a wonderful alternative to sugar and artificial sweeteners for those who have diabetes." Similarly, a study conducted at the Department of Endocrinology and Metabolism, Aarhus University Hospital, Denmark, has found that stevioside enhances insulin secretion from mouse's pancreatic islets in presence of glucose. The researchers state, "Stevioside stimulates insulin secretion via a direct action on pancreatic beta cells. The results indicate that the compounds may have a potential role as an anti-hyperglycemic agent in treatment of type 2 diabetes mellitus." As soon as one enters the town from Jalandhar side to bus stand, encroachments become visible. Rehriwalas and auto-rickshaws occupy both sides of the road, making the passage narrow for buses and other vehicles. Traffic jams are frequent here. Near the Tehsil Office, there is a traffic jam when some heavy vehicle passes through the road, as the parking space on the other side of the road in front of the Surya Complex remains occupied by rehriwalas. In case one has to take a turn toward Devi Talab Gurdwara from bus stand road, one has to wait for auto rickshaws to clear of the road. In the Sadar Bazaar, no four-wheeler is allowed. Still, it is difficult to walk on the road, as rehriwalas manage to sneak in the market, occupying the road that is hardly 20- foot wide. Some shopkeepers of the market also display their goods on the roadside. 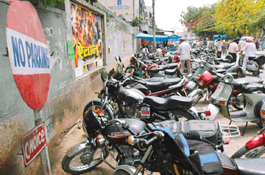 In Satnarayan Bazaar, rehriwals have even blocked the entry gates of the District Public Relation Office and Government Girls Senior Secondary School. The situation in Bania Bazaar, Kaserian Bazaar, Srafan Bazaar, Amrit Bazaar, Sabzi Mandi and Kaimpura Bazaar is not different. On the Sultanpur Lodhi Road in front of the Civil Hospital, fruit vendors occupy all space. The indifference of police and administration can be gauged from the fact that rehriwalas and vendors have encroached upon the portion of roadsides in front of the Baghi Khana which houses the CIA Staff, Vigilance Department and DSP (Detective) offices. On the other side of the road is situated the district court complex, also housing District Courts, besides SSP office, DC office and other administrative offices. Former SSP, Mr Aroonpal Singh, had formed a traffic advisory committee, and the committee had put up several suggestions, but those suggestions are still awaiting implementation. The temple offers a peep into the last century. Shri Vishvakarma Temple on the Banga Road in Phagwara is famous for its beauty and fair held on Vishvakarma Jayanti. It is equally famous for yet another thing - its age. It is nearly a century-old temple. This temple was constructed in 1911 under the supervision of Pandit Nathu Ram of Mandali village. In 1945, the Doaba Dhiman Sabha reconstructed and developed the temple and later on the Vishvakarma Dhiman Sabha bought an additional land measuring about five acres and constructed the langar hall. The dome, where the statue of Lord Vishvakarma is installed, is worth seeing. It is embedded with small pieces of coloured mirrors. Mirrors have been placed in such a manner that devotees can have the view of Lord Vishvakarma from the three doors of the temple complex. Interestingly, the temple complex also houses a library, an allopathic and homoeopathic dispensary. It has an ultra-modern eye hospital, where free eye operations are performed and medicines and spectacles are given free of cost. Two doctors have been employed here for the purpose. It has a big conference hall and about four rooms for the stay of devotees coming from far off villages and towns. Recently, a computer centre was also started to impart education to needy students at a very nominal fee. At the annual fair, people throng the temple in lakhs. Free langar is served to devotees at that time. Famous singers also come to the fair and sing bhajans. Senior vice-president of the Vishvakarma Dhiman Sabha, Mr Ramesh Dhiman, told Jalandhar Plus that Vishvakarma pooja fair, one of the famous fairs of Punjab, gave the message of brotherhood and harmony. "We are planning to construct a school of international repute very shortly," said Mr Amrik Singh Lall, president of the sabha. "The university has decided to impart quality vocational training in different streams to the students of government schools in rural areas to ensure their competitiveness in the global job arena. It is planned to introduce mobile teacher programme. Under this concept, the faculty of affiliated learning centres of the university will regularly visit such identified schools to train the students in rural areas," Dr S.K. Salwan, Vice-Chancellor of the PTU, tells us. He said that a comprehensive draft was being prepared by the university authorities as per the report on revitalisation of the technical education in Punjab released by Deputy Chief Minister, Ms Rajinder Kaur Bhattal, recently. "In the first phase of this pilot project, we will cater to 20 identified villages, wherein learning centre concerned will depute faculty members to train students. The contents of training have already been formulated. After this, the mobile teacher programme will be implemented in the entire state," he said, adding that the PTU was the first university in the country to undertake such a programme in rural areas. Dr Salwan revealed that the university had also decided to introduce short-term courses in different technical streams to improve knowledge of skilled labourers. "Sometimes, the skilled labourers fail to get a job in a reputed concern for want of qualification. We have decided to introduce short-term certificate courses in various streams, including fashion designing, electric technician, motor mechanic, computer applications and auto-electrician. This will certainly help the industry in recruiting qualified staff," said Dr Salwan, adding that the entire curriculum of the courses being run under the Distance Education mode had been re-oriented to make it more competitive in global job arena. "In another initiative in rural education sector, we are contemplating a plan to impart technical training to the dropout students, who have failed to continue their studies. We need to channelise their energies to the maximum extent to make them earn better livelihood," said Dr Salwan. The Vice-Chancellor further said that over 900 students had recently been selected for appointment as computer teachers in the government schools. Value-oriented education with all-round development of personality of students is the aim of the Guru Nanak College of Education for Women, Kapurthala, says acting Principal, Ms Gurcharan Kaur. It was in 1966 that the college was started in Elysee Palace (on the Mall Road) built by Bikrama Singh in 1862. The college is managed by the Montgomery Guru Nanak Educational Trust, Jalandhar. The trust had as its objective the revival of the missionary spirit of late Bhai Gobind Singh Pasricha. With the collaboration of Late Sardar Hukam Singh, a former Lok Sabha Speaker, and Sardar Gian Singh Rai, it aimed at providing quality education to women. The college offers 110 seats in different combinations of Science, Mathematics, Social Studies, English, Punjabi, Commerce and Economics. Computer Education at the fully-equipped computer laboratory and participation in sports is a must for all students. To inculcate social values in the students and to make them confident, the morning assembly is dedicated to different issues like women's education, population control, global warming and AIDS. The students are motivated to present their views. The students are encouraged to participate in co-curricular activities and sports. Seminars are held regularly. "Studies are important. But at the same time, it is equally important that the students develop a holistic attitude towards life. So, they are encouraged to do extra reading and take part in cultural activities," maintain college authorities. "Recognised by Guru Nanak Dev University, UGC and NCTE, the institution takes the responsibility of not only imparting the training theoretically, but also stressing on school teaching practice, performance and skill development to produce dynamic teachers, who will help in the development of the nation," claims the acting principal. The college is preparing to get accredited by NAAC and is planning to increase its seat capacity to 150. Sardar Prem Paarkash Singh, popularly known as PP Singh, is the honorary secretary of the Pepsu Women Hockey Association, an affiliated unit of the Indian Women Hockey Federation. He remained associated with the District Kabaddi Association, Kapurthala, the Punjab National Style Kabaddi Association, the Punjab Table Tennis Association, besides umpiring for a women's hockey match between Sri Lanka and India in 1975 in Delhi. Though he had to stop participating in sports during school days due to a fracture in ankle while playing football, his zeal for sports remained intact. When asked about his passion for sports, he said, "In 1947, at the time of Partition, I escaped being stabbed in Sargodha town, now in Pakistan, only because I was a sportsperson. My school mate, Malik Mohammed, saved me. He told the goons that I was a sportsman of his school and that he would not let them kill me." Disappointed at the lack of interest in women's hockey among city folks, Sardar PP Singh has mooted an idea to organise hockey matches in rural areas of Punjab. He is the convener of the Dhanoa Rural Women Hockey Promotion League and has created eleven centres in Punjab, where playgrounds and sports facilities are being provided with the cooperation of villages. Sardar Harjinder Singh Dhanoa from the United Kingdom has promised to sponsor all transport and uniform expenses of all players participating in the tournaments being held at these centres which are situated at Pakharpur, Bahoroo, Kairon villages in Amritsar, Tibba village in Kapurthala, Khusropur village in Jalandhar, Chhabewal village in Hoshiarpur, Chiniwala Kalan and Moonak villages in Sangrur, Nararoo village in Patiala, Badal village in Muktsar, and Thakanvad village in Moga. The boarding and lodging will be provided by the host village. The students of primary section of Lawrence International School were taught salad-making by their teachers on Friday. The kids were told to bring five pieces of any raw edible vegetables. The activity was arranged to help the children learn about the colours of vegetables and also the usefulness of salad in food, besides developing social skills of working together, said Ms Ritu Sareen, Ms Dua and Ms Monga, all staff members of the primary section of the school. The kindergarten section of Dayanand Model School, Model Town, organised an activity for the children on Saturday in which they were taught to prepare lemonade to beat the scorching heat of summer. The children bought the material themselves and learnt about the benefits of the cool health drink. The management of Mama's Pride organised a dance party at a hotel on Friday. Titled "See u soon", the party was held on Friday, the last day in the school before the vacation. The kids danced to the tunes of their favourite numbers and enjoyed their favourite summer punches and ice creams. The students of primary section of Apeejay School enjoyed summer cool party on the last day before the summer vacation. The students came in colourful dresses, danced and relished ice creams and bhelpuris. The best-dressed students were given prizes. Apeejay School, Rama Mandi, organised a fancy dress competition on Monday in which the students came in colourful dresses and exhibited their talents. A cultural show was also held. Mr Kulbir Sahni, Deputy District Education Officer, was the chief guest on the occasion. The Lovely Institute of Management organised a national seminar on "Globalization: Opportunities and threats" on Saturday in association with the Indian Industry and Technology Development Board, TNET Centre. Dr S.K Salwan, Vice-Chancellor, Punjab Technical University, was the chief guest on the occasion. Dr R.S Khandpur, Director General, Pushpa Gujral Science City, was the guest of honour. He said that India would have to upgrade research and development facilities to compete in the international market. Prof Sucha Singh Gill, a renowned economist of the country, opined that globalisation was a challenge that must be converted into an opportunity by thinking afresh, making investment, introduce new technologies and new products. Researchers, academicians and industrialists from across the country attended the seminar. Guru Nanak Dev University College has bagged the first five slots in MBA (First Semester) examination. Jasmeet Singh has bagged the first position with 83.3 per cent marks, followed by Chandani Babbar (80 per cent) and Anu Gupta (79.6 per cent), who secured the second and the third positions, respectively. Shyana Singh from the same college has stood fourth with 79.5 per cent, while Manpreet Singh, with 77.8 per cent, has ranked fifth in the university examinations. Saranjeet Singh, again from the same college, has got the first position in MCA (Fifth Semester) exams. He scored 81 per cent. Manpreet Kaur and Navjot of the Apeejay College of Fine Arts bagged the second position in M.A-I (Music Vocal) examination conducted by Guru Nanak Dev University by getting 326 out of 400 marks. Malvika Gupta from the same college bagged the third position in MA-II (Music Vocal) examination by getting 626 out of 800 marks, while Gagandeep Singh stood fourth. He got 623 marks out of a total of 800 marks. Sakshi Syal, a student of BBA-III of the Apeejay College of Fine Arts, has got 1522 out of 2000 marks in the examination conducted by the university this year and has bagged the second position. Ankuna Syal from the same college has bagged the sixth position in the university. Deepak Dhall, a student of BBA-II of the Apeejay College of Fine Arts, has secured the fourth position in the university by getting 917 out of 1250 marks. Harpreet Kaur, a student of B.Tech (Third Semester, Computer Science and Engineering) of the DAV Institute of Engineering and Technology, has bagged the first position in Punjab Technical University by getting 725 out of 850 marks. Dilpreet Kaur Sahni, a student of B.Tech-III Semester (Information Technology) from the same institution, has also bagged the first position by getting 718 out of 850 marks. Companies like Sterling Telecom and Net Services, Chennai, Sebiz Infotech, Mohali, and IBM Daksh, Gurgaon, held campus placements at the DAV Institute of Engineering and Technology for recruitment. IBM Daksh, Gurgaon, selected nine students for the final placement, while Sebiz Infotech selected 20 students for industrial training. To update students about career opportunities, the Golden Crescent Tour will hold a career fair — Education Worldwide — at the Lyallpur Khalsa College for Women on June 3 and 4. The district chapter of FOGSI organised a seminar on women's health problems at Kanya Maha Vidyalya here on Tuesday. Dr Pankaj Desai highlighted various ways to ensure proper health of would-be mothers. As many as 571 recruits of the 139th batch participated in the passing-out parade at the PAP Grounds on Tuesday. ADGP (PAP), Mr Rajan Gupta, took the salute from the recruits, who had successfully completed the training. The army will be organising a recruitment rally for the category of Soldier (General Duty) from June 16 to June 26 at Kapurthala for the candidates from Jalandhar, Kapurthala, Hoshiarpur and Nawanshahr. The SAD Chief, Mr Parkash Singh Badal, inaugurated an air-conditioned mortuary at Kot Kishan Chand locality here. The air-conditioned mortuary has been set up by the Manav Sewa Trust. NGO Pahal organised the World No-Tobacco Day on the campus of the Heritage ITC here. About 350 boys and girls attended the function. A painting contest was organised on the occasion. Mr Gaurav, Ms Shabnam and Mr Ramandeep Singh were declared first, second and third, respectively, in the competition. The Pahal president, Mr Lakhbir Singh, spoke on the ill-effects of tobacco and the need to keep the society tobacco-free. Mr Avtar Singh, Deputy Registrar, Co-operative Society, was the chief guest.